In December 1924, the martial manual “WuShu” written by WuYing and handed from ancestors got damanged, and then stolen. 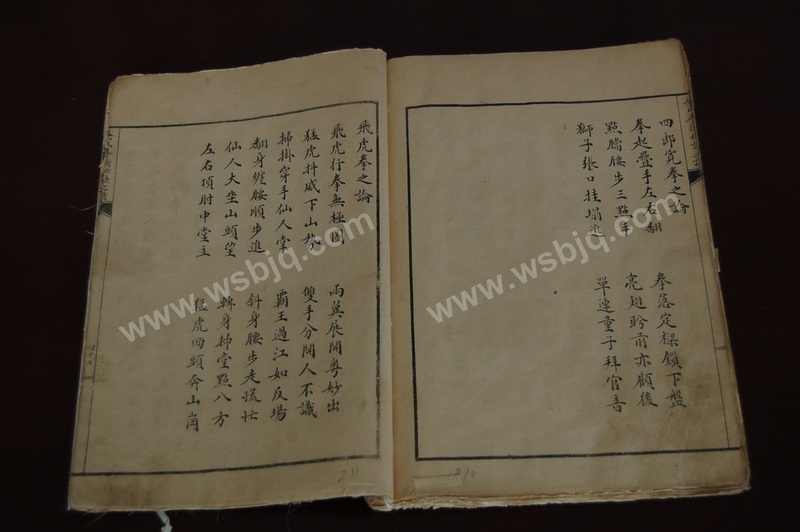 So in 1927, with the help of Qiang RuiQing (强瑞清), Wu HuiQing began to write a new version of the Wu family Baji Quan manual. (see "Wu HuiQing" page for more details). 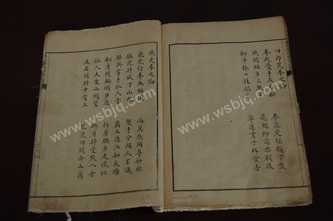 From his hand written original, 10 copies were printed by lithography, and only 3 or 4 copies of the manual have survived so far. Chinese Wushu originates from the most ancient times. According to legends; it started when HuangDi Emperor started to create weapons. 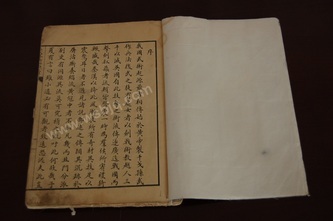 After Sun Wu wrote BingFa, among the people training martial art there was a maiden (i.e. the Lady of Yue, also known as the Maiden of the Southern Forest). Using sword and halberd she taught over 3 000 people from Yue kingdom, in order to destroy Wu kingdom. After this, the art of fighting spread widely until the warring state era, and the heroes of sword fighting all became famous during this period. These people were hired as martial instructors by the nobles and kings, and this tradition was flourishing. Starting from the Qin and Han dynasty, this tradition declined gradually. All of these people had rare and unusual talents, enough to amaze people. However the anecdotes concerning them only appeared in oral transmission. A great number of them made a low life as butchers or servants or as Buddhist or Daoist monks. Furthermore, the schools got divided in separate branches. Also, schools from the same source got divided. It is hard to understand why it became so. Zi Xia (i.e. one of Confucius disciple) said that even the minor arts have worthy perspectives. Fearing that uneducated people would think that all this minor arts had no interest, Zi Xia strongly refuted this way of thinking. 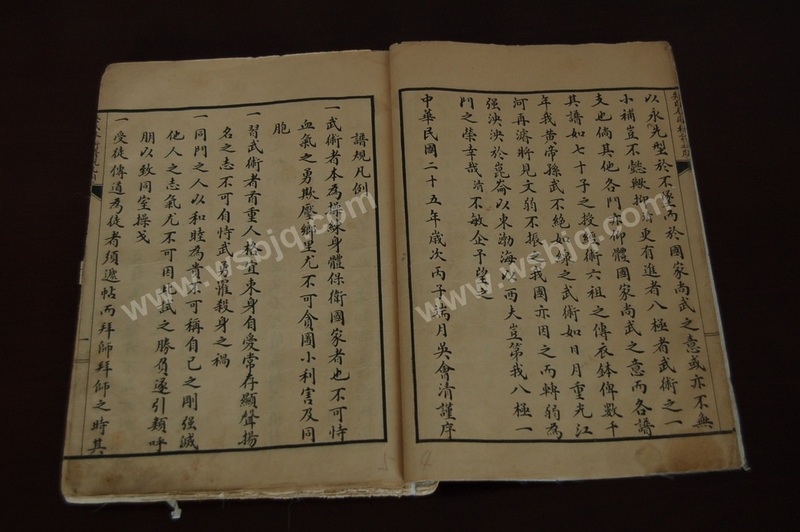 Since the emperor Qin Huang centralised army, and the Han and Wu dynasties promoted Confucianism, giving less importance to martial arts and more to literature became the tradition. After the book ShiJi by SiMaQian (i.e. 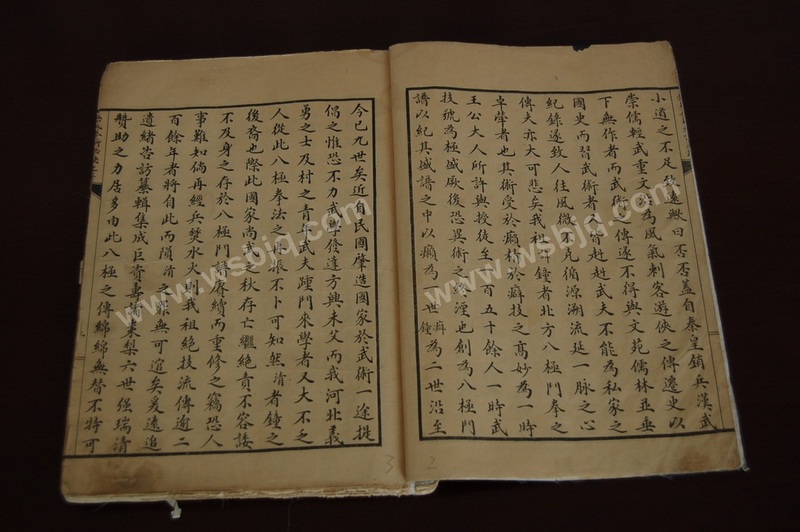 a Chinese historian living under the reign of WuDi emperor), there was no writer who recorded the history of assassins and wandering knights. Thus, the transmission of martial arts was not recorded along with the literature and academic history of countries. Furthermore, all the people training martial art were not able to record their history by themselves, which led people to neglect the tradition. It was also impossible to trace back the origin of one school branch, and this was lamentable. My ancestor Wu Zhong was an outstanding Baji practitioner from north of China. He received his art from Lai and refined it with Pi. His skill in fighting was praised by the princes and nobles of his time. He taught over 150 students and his martial skill was considered as the highest accomplishment. Afterwards, fearing that YiShu (i.e. “unusual style” ) would fall into oblivion, he established the manual of the BajiQuan school in order to record its development. 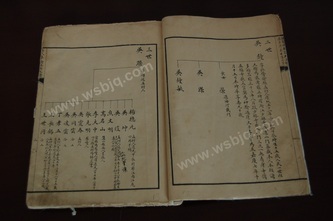 In this manual, Lai is considered as the first generation and Wu Zhong and Pi are considered as the second generation. Up to now, nine generations have passed. Recently, when the Chinese Republic was established, the government encouraged the practice of martial arts because he feared that the country would lack forces. The study of martial arts started to develop again. Then, righteous and courageous masters, and young people coming out from villages to learn martial arts were numerous in the Hebei province. Hence, at this time when the country was promoting martial arts, I WuHuiQing, descendant of Wu Zhong, I would not tolerate to be blamed for escaping my responsibility to decide whether our martial art should continue or disappear. So I decided to rebuild and continue the manual of the Baji Quan school. I am worried that human affairs are unpredictable, and about what would happen if we should endure again the turmoil of war. The unique skill of our ancestor has been handed down for more than 200 years, and it would from then on disappear. My guilt would not be forgivable. I travelled far away to seek the cause left to us by our forefathers. 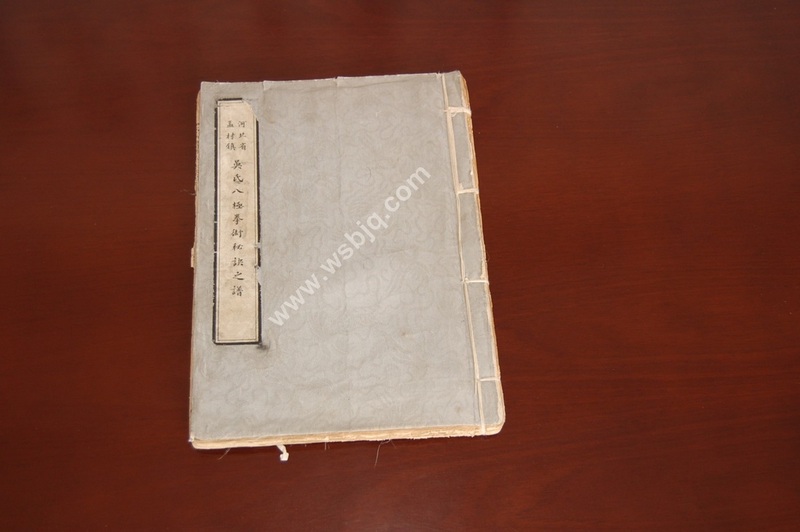 I gathered enough written material and money to print a book，mostly thanks to the help of the 6th generation inheritor Qiang RuiQing. Thus, the transmission of BajiQuan will stay continuous for eternity and will not decline. This art will be preserved, and since the country is praising martial arts, it will probably be of some help. I will also have another contribution : BajiQuan is a school of martial art, if each of the schools understand the country’s need for martial art, then each of them will have its own martial record. 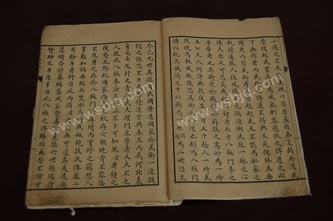 Like the 72 disciples of Confucius have transmitted the knowledge of classics, like the six patriarchs of Zen have transmitted all their knowledge to their disciples, martial arts will be ceaseless like a thread and it will be transmitted through many thousands of years among us, the descendents of HuangDi. Martial arts will be shining bright like the sun and moon, and it will be like a river free to flow again. Then, our weak and low spirited country will turn strong. It will be magnificent from Kulun mountains on the west, to BoHai sea on the east, and our school of BajiQuan will be dignified. This is my humble hope. Preface cautiously written by Wu HuiQing, 25th year of the Chinese Republic, 13th year of the sexagenary cycle (i.e. 1936), first lunar month. "